New suite accommodations Havana Cabanas. Debuting in spring 2016 is the largest ship in the Carnival Cruise Lines fleet, the Carnival Vista. With a passenger capacity of 3,936, the Vista will offer Mediterranean itineraries to such countries as Spain, France, Croatia and Turkey. 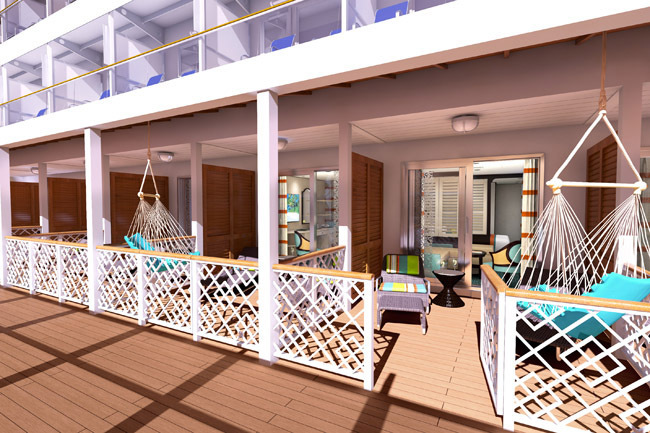 The Vista, arriving on U.S. soil in November 2016, features new suite accommodation classes like the Havana Cabanas with private patios for lounge chairs and a hammock; and located on a dedicated family zone area on Deck 2 is the Family Harbour suites, able to accommodate up to five guests. 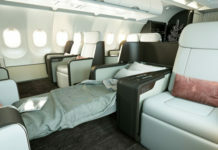 The Vista will also offer the adults-only Serenity retreat area; the Cloud 9 Spa with the line’s first infrared sauna and hamman; Camp Ocean for kids up to 12; a Carnival Multiplex with an IMAX Theatre; and The Warehouse featuring video and arcade games. PONANT’s Le Lyrial is the fourth sister ship in this French line’s series of signature yacht-style vessels offering expedition cruising to all seven continents. The inaugural season began this month with journeys to the Mediterranean, Adriatic and Aegean seas. Le Lyrial features 122 staterooms and suites, and 95 percent of suites include private balconies. 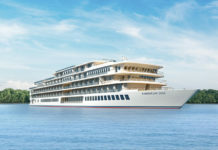 The ship also features two restaurants, a bar lounge and 24-hour in-room dining service; a full-service SOTHYS spa; an outdoor pool with a bar; a library and a 250-seat theater for live entertainment, film screenings and presentations; and a fleet of expedition Zodiac boats outfitted with satellite tracking. Le Lyrial will sail on an 8-day Gourmet Cuisine in the Adriatic itinerary starting in Athens and winding through spots along the Dalmatian Coast with talented chefs and renowned sommeliers on board. The cruise, priced at $4,640 pp, sets sail on Aug. 15. The 150-passenger American Eagle is the newest paddlewheeler from American Cruise Lines designed to traverse the Mississippi River. The ship will offer 7-, 14- and 21-night roundtrip itineraries from Memphis to New Orleans; New Orleans to St. Paul; and St. Paul to St. Louis. Staterooms are spacious at over 300 sq. ft. and 93 percent of staterooms feature a private balcony. Other amenities include a top deck cafe, an outdoor putting green, seven lounges, guest lectures, and themed itineraries from the Civil War to cuisine. The American Eagle is offering an 8-day New Orleans Roundtrip Cruise (starting rates $4,450 pp; departing Oct. 24) stopping at ports of call along the Mississippi River that include New Orleans, Natchez, Vicksburg, St. Francisville, Baton Rouge and Oak Alley. A new ship in Holland America Line’s Pinnacle Class is the ms Koningsdam, scheduled to set sail on its premier voyage in April 2016 from Italy. This 2,650-passenger vessel is introducing a few new firsts for the line’s accommodation offerings with 32 specially designed staterooms for families and 12 new single, oceanview cabins. The family staterooms accommodate up to five guests, feature two bathrooms, and range from 222 to 231 sq. ft.; the new single cabins range from 127 to 172 sq. ft. Guests will also enjoy a new French seafood dining venue, Sel de Mer, and a new farm-to-table dinner experience at the Culinary Arts Center presented by Food & Wine magazine. From November 2016 to March 2017, the ms Koningsdam will sail to the Caribbean on roundtrip voyages from Fort Lauderdale. One itinerary is the 7-day Caribbean trip stopping at Turks & Caicos, Puerto Rico, the U.S. Virgin Islands and the Bahamas (the first sail date is Dec. 23, 2016). 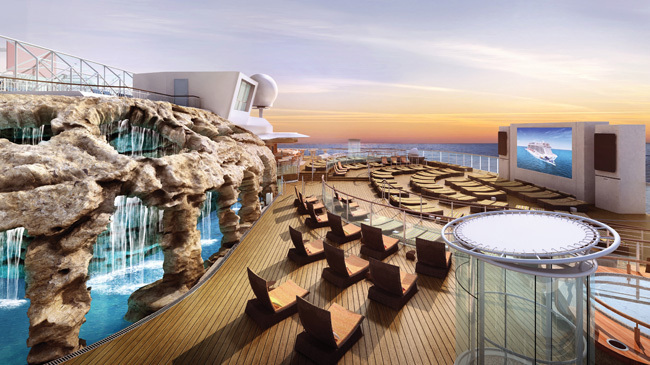 MSC Cruises revealed the details of its new Seaside Class at Cruise Shipping Miami 2015. The first ocean liner in the next generation of MSC ships for the Geneva-based cruise line is the MSC Seaside, a 4,140-passenger ship debuting in late 2017 and sailing to the Caribbean year-round from Miami—the ship will also be the first MSC vessel to be christened in the U.S. and docked at the Port of Miami. 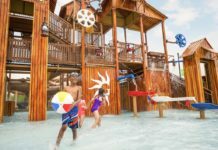 The Seaside is a massive ship with 2,070 staterooms and an innovative aqua park that includes the Dueling High-Speed Aqua Tubes ride where guests can race each other through a combined 525 ft. of twists and drops. The ship will also feature Slideboarding, a unique water slide and video game experience in one, as well as a waterfront promenade and high-end suites designed to look like apartments. Norwegian Cruise Line’s 4,200-passenger Norwegian Escape. Coming October 2015 is Norwegian Cruise Line’s 4,200-passenger Norwegian Escape. The Escape, the first in Norwegian’s Breakaway Plus Class, will feature 19 restaurants and 11 bars (the ship will also feature the first at-sea, Jimmy Buffet-themed Margaritaville restaurant, and Miami’s oldest bar, Tobacco Road), a sports complex with a 3-story ropes course, the Aqua Park with four multi-story water slides and pools, and let’s not forget live entertainment, a spa, the Entourage teens club, and the first for the line, the Guppies Nursery for children ages 6 months to 3 years old. The Escape, sailing on 7-day Eastern Caribbean cruises from Miami to St. Thomas, Tortola and Nassau, offers 95 exclusive suites on Decks 17 and 18 in The Haven; amenities range from a private restaurant to concierge services, and the center of The Haven includes a 2-story courtyard with a retractable roof, a pool, and private spa treatment rooms. Viking Cruises’ Viking Star, which is the first of three new ocean liners from the company’s small-ship cruising division—the Viking Sky is currently under construction and the Viking Sea will be delivered in mid-2016—is a 930-passenger ship and had its inaugural sailing in April. 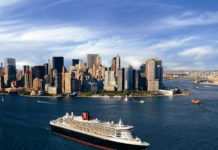 The ship offers guests five stateroom categories, starting from a 270-sq.-ft. Veranda stateroom to 14 Explorer Suites, which are 2-bedroom suites ranging from 757 to 1,163 sq. ft. with wrap-around private verandahs. An interesting element is in the Star’s spa, which features a snow grotto with snowflakes descending from the ceiling; and the ship also includes a Star Theater and an onboard cooking school. Sold out until May 1, 2016 is the Viking Homeland itinerary, a 15-day journey ($5,799 pp) to eight countries, including Sweden, Russia, Estonia, Poland, Denmark and Norway. The second ship from Royal Caribbean’s Quantum Class, the new Anthem of the Seas, is a 4,180-passenger ship with 2,090 cabins, including 375 virtual balconies—inside cabins with real-time views of the ocean and the destinations where the ship docks. Anthem of the Seas offers many amenities similar to its sister ship, Quantum of the Seas, from the RipCord by iFly, a skydiving simulator, to the North Star, a jewel-shaped glass capsule that rises 300 ft. above the ship offering 360-degree views. 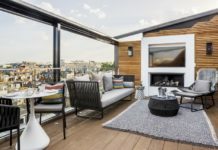 Along with the virtual balconies in some inside cabins, the Anthem is offering family-connected staterooms and studio cabins with large balconies for single travelers. The ship also features the Two70 lounge and the SeaPlex, where passengers can challenge each other at bumper cars, throw on some skates for disco roller skating, and learn the ropes at a circus school. Regent Seven Seas Cruises’ Seven Seas Explorer, coming in the summer of 2016, is a 750-passenger, all-suite and all-balcony vessel offering guests all-inclusive luxury at sea. The company introduced a new category luxury suite exclusively for the Seven Seas Explorer, the Regent Suite—a 2-bedroom, 3,875-sq.-ft. suite considered an in-room spa retreat with a personal sauna, steam room, and treatment area. If your clients book the new suite, some amenities come with it: A private car with driver and guide at every port, free and unlimited laundry and pressing, and business and first class air; as well as private sedan transfer to and from the airport. The ship will also feature three specialty restaurants, including the fleet-wide Prime 7 steakhouse and the Chartreuse, a French-inspired dining venue.